Join the Second Annual Blended Burger Project™! Help the Rookery's "One Way Out" burger launch nationally! The Blended Burger Project™ is a movement that strives to make burgers better by blending ground meat with chopped mushrooms, creating an incredibly delicious patty that’s healthier for you and more sustainable for the planet. 2016 marks the second annual Blended Burger Project™, in which chefs across the nation, including those who already make some of the best burgers around, have the opportunity to work with the James Beard Foundation and show guests how great taste, better nutrition, and increased sustainability can come together to improve the quality of the food they eat. The Rookery has been invited to participate in the James Beard Foundation nationwide project to create a burger that is not only delicious, but healthy as well. So, if you love a great burger and you like mushrooms then you're going to LOVE what the Rookery is cooking up this year! Afterwards, please visit https://www.jamesbeard.org/blendedburgerproject/vote and let the folks at the Blended Burger Project know how much you loved the Rookery's "One Way Out" blended burger. Voting closes July 31st! So, how does saving the planet and maintaining your health while enjoying the Rookery's delicious burger sound? 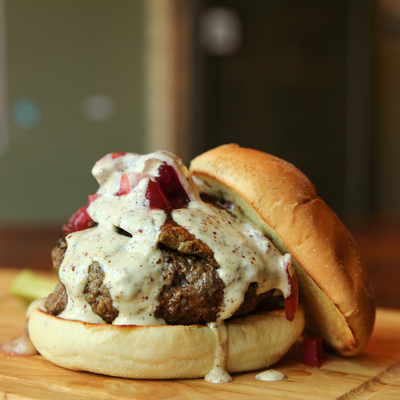 Vote for their blended burger in the James Beard Foundation Blended Burger Project today and everyday! The James Beard Foundation's mission is to celebrate, nurture, and honor America's diverse culinary heritage through programs that educate and inspire. The Blended Burger Project™ is a movement that strives to make burgers better by blending ground meat with chopped mushrooms, creating an incredibly delicious patty that’s healthier for your guests and more sustainable for the planet.